eBay is the holy grail for bargain hunters but, during Black Friday transactions could quickly turn from pleasant to ugly and you could see yourself caught up in fraudulent activity. The rule of thumb is if it looks better than butter, it’s not real. We know everyone loves a good sale but urgency shouldn’t be your priority. Doing your research on items you really want to buy, before Black Friday, will massively help you in distinguishing the genuine deals from the fake. To help you get started we’ve listed what you should look out for to determine whether an eBay listing is fake or real, to avoid you losing your hard earned cash. 1. Don’t skim over the descriptions, read them. 2. Are stock photos being used? Most buyers get too excited seeking out deals on Black Friday that they forget to pay attention to what they are bidding on or buying. It’s a classic rookie mistake to skim over the description as sometimes what you see won’t necessarily be what you get. Have you heard of the Gucci bag listing that actually turned out to be a photograph of a Gucci bag? Turns out that it was written right there in the description, and not in small print. There are a lot of excellent sellers on eBay but within them lay some convincing fraudsters. The moral of the story is, read before you bid. A note on mobile phones: If you bid or buy on phones make sure the phone is listed with a charger and the box. If it’s just the phone, it may be a stolen one. You’ll be able to tell if it’s stolen as the sellers will write that it’s been blocked. If something feels off to you, ask the seller a question, genuine sellers will be happy to answer anything about the product. Genuine sellers do not use stock images to display on their listings. Avoid any sellers that refuse to show you real photographs of the items they are selling. Have they sold the item before? If so, did they appear legitimate to buyers? You want to look at these when buying anything designer. How many reviews do they have? Are they from genuine buyers? Do they leave reviews for buyers? Have they had many disputes? We all want to see discounts on Black Friday but if popular items show huge discounts than it’s probably a fake listing. For example, if a new seller has just started listing the week before Black Friday and they are listing 30 iPhones at a “low” price you probably should know: you are about to be hustled like Terry Benedict. Seek out what prices are set for popular items such as the iPhone, PS4 and Smart TVs to recognise when a price is ‘too low’. Whether you buy expensive or non-expensive items on eBay you should always ask to have them posted accordingly. Anything over the value of £20, have it sent signed for. A good seller will always list items of value with signed for postage and tracking. On Black Friday you want easy transactions and PayPal is your best payment option. Most sellers, if not all should take payment via this method. Stay cautious if anyone asks for payment via instant cash wire or money transfer services such Western Union. If you come across a listing that tells you to contact the seller before you bid or buy, avoid the listing. Most sellers who want buyers to contact them will try to get them to negotiate outside of eBay, and it may sound tempting when they offer you a lower price but these transactions could end up very messy and you won’t have the help of eBay to sort anything out for you afterward. If you receive eBay Black Friday deals emails which contain a weird email address like the one below, do not sign in to your account from the email. 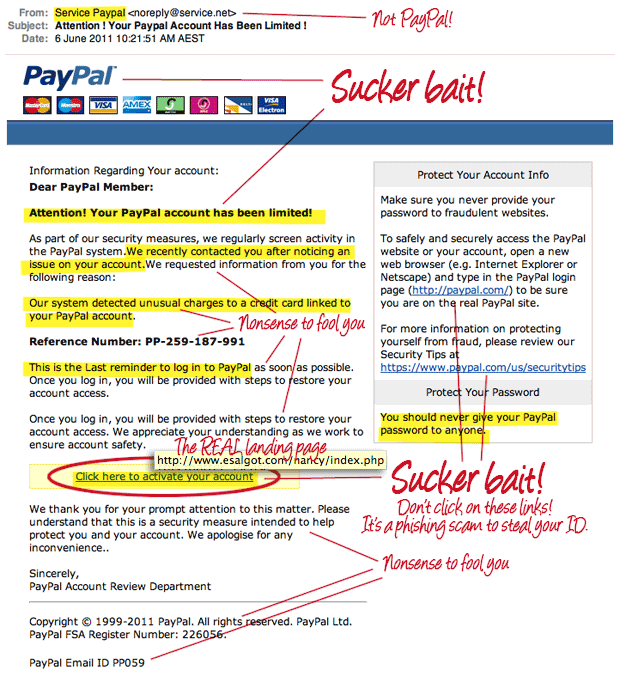 Phishing emails tend to go out a lot during Black Friday claiming to be from eBay but these are scam artists trying to get your account information. Has the buyer brought anything before and how old is their account? Most sellers get scammed after the item has been returned. Did you hear about the wood pellets that were sent back in the place of a mobile phone? Although eBay is getting better with seller disputes, buyers are usually favoured. If a buyer sends back an item, tell them to send it via recorded delivery and when something is returned, document the box opening process to make sure what you sent you have received back. Get on eBay’s case straight away if it’s not the correct item you send them. And if eBay refuses to revolve your issue, social media works well in getting brands to resolve a dispute. Try to keep listing within the UK to avoid overseas scam artists buying your items. Do not accept other forms of payment such as cash wire transfers or Western Union Transfer.